Charged with making a last-minute dessert for the staff at Momofuko Restaurant, pastry chef Christina Tosi scavenged ingredients in the pantry and created her now infamous Crack Pie. Originally baked with an oatmeal crust, you might assume the name comes from the crunch. But it became so popular, the addictive meaning of the drug also applies. I saw it best described as a pecan pie without the nuts. 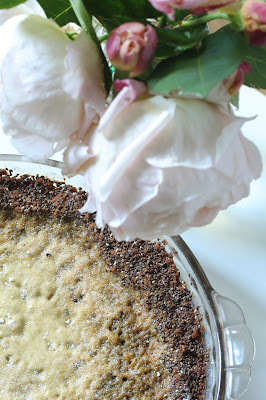 Even with substitutions of chia seeds for oatmeal, coconut sugar (in a reduced amount in the crust), and coconut cream for dairy, it was still melt-in-your-mouth delicious. You might, however, have to do a little 'splaining about the name. Line the bottom of a 13 x 9 x 2-inch metal baking pan with parchment and spray with non-stick vegetable spray. Set aside. 1. Add 6 tablespoons butter and 3 tablespoons coconut sugar in a stand mixer with the metal whip attachment. Bean on medium high until the mixture is light and fluffy. about 2 minutes. Scrape down the sides of the bowl as needed. 2. Add the egg and beat until pale and fluffy. 3. Add the chia seeds, flour, baking powder, baking soda, and salt and beat until well blended, about 1 minute. 4. Spread batter out onto the prepared baking sheet, pressing it out evenly throughout the pan. 5. Bake until the cookie turns light golden on top, 17 to 18 minutes. Transfer baking sheet to a rack and allow to cool completely. Butter the bottom and sides of a 9” glass pie plate. Set aside. 1. In a large bowl, crumble the chia cookie. Add 3 tablespoons butter and 1 tablespoon of coconut sugar. Mix with with your fingers, rubbing between your palms to thoroughly mix. 2. Using fingers, spread the mixture on the bottom of the pie plate. With your fingers or the bottom of a glass, press the mixture up the sides of the pie plate. Try to get a consistent thickness on the bottom and sides. 3. Place the pie plate on a metal baking sheet and set side to make the filling. 1. In a medium bowl, whisk both sugars, milk powder and salt to blend. Add melted butter, and whisk until blended. 2. Add coconut cream, egg yolks and vanilla and whisk until well blended. 3. Pour filling into prepared crust, and bake for 30 minutes filling may bubble up). 4. Reduce heat to 325 degrees F. Continue to bake for another 15 - 20 minutes until the filling has some brown spots and has set around the edges. The center may still jiggle slightly when the pie is moved. 5. Move the pie dish to a rack and let cool for about 2 hours. Chill uncovered overnight. Serve cold. 6. Sift with powered sugar when ready to serve, optional. Pie can be stored in the fridge for about 4-5 days. Let sit out awhile before serving so it is easier to remove from the pie plate. Recipe for "Crack Pie" from the Bon Appetit website here.